Ethical standards for proofreading/editing exist to ensure high-quality scientific proofreading and editing; public trust in scientific discovery; and that people receive credit for their ideas. Edit Syndicate is a member of the Committee on Publication Ethics (COPE) and abides by its Code of Conduct and aims to adhere to its Best Practice Guidelines. Edit Syndicate ethics committee is an independent committee that is responsible for supporting the various scientific scholars and writers in resolving issues that infringes on this proofreading/ editing policy. Edit Syndicate ethics committee is made up of five professors selected from different reputable institutions of higher learning across the globe. Edit Syndicate ethics committee review cases of misconduct and make recommendations including appropriate sanctions. The committee is guided by COPE, ICMJE, STM, and WAME requirements as guidelines in making decisions and recommendations. Manuscript should be prepared in Microsoft word format in any font style and and size. Once a manuscript is submitted, it is assumed that all authors have read and given their approval for the submission of the manuscript. Declaration of Conflicts of Interest should be stated in the manuscript (if any). A submitted manuscript is a confidential material. Edit Syndicate will not disclose submitted manuscript to anyone except individuals who partake in the proofreading and formatting of the manuscript. These individuals include proofreading/editing staff and the corresponding authors. However, in suspected cases of misconduct, a manuscript may be revealed to members of Edit Syndicate's ethics committee that may require it for the resolution of the misconduct. Manuscripts are assigned to members of the proofreading/editing board according to area of specialization. Misconduct constitutes violation of this proofreading/editing policy or any applicable guidelines/ policies specified by the Management of Edit Syndicate. Any other activities that threaten/ compromise the integrity of the proofreading/editing process are potential misconducts. Suspected cases of misconduct will be investigated. 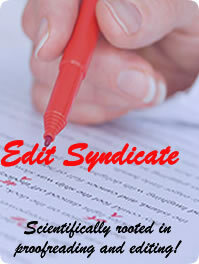 Edit Syndicate will review and update this proofreading/editing policy periodically. Postcode: Southport PR9 0EZ, UK.